Preparing to Give 2014's World War I Commemorations the PC Treatment: " Everyone is terrified of being called ‘triumphalist’ or, worse still, ‘jingoistic’ "
Oh dear. I think we can already see how this one is going to play out: mud, futility of war, lions led by donkeys, a bit of poetry, a nod to the nurses and the munitions girls and a solemn conclusion that it must ‘never be allowed to happen again’. As we approach the centenary of the Great War, we must strenuously avoid acknowledging that it actually achieved anything, let alone that we were vaguely on the side of right. For that would commit two sins. First, it might upset the Germans. Second, it might suggest that there was actually a point to all that slaughter. Thus does Robert Hardman start his non-PC World War I article in the Daly Mail. ‘There is an intent in government not to upset the Germans.’ So says a senior source on the Government’s centenary advisory committee, talking to the Sunday Times. As usual, then, the villains will be those blimpish British generals and the hard-faced arms manufacturers. Certainly, when I called yesterday, the Department of Culture (supervising the £50 million anniversary) was happy to confirm that the main focus of next year’s centenary is to be remembrance. As for history? Well that seems to be secondary. But let no one mention the V word. Indeed, you can scan the official blurb about the centenary and the word ‘victory’ is barely mentioned. No one ‘won’ this war, is the subliminal message. It just stopped because everyone had had enough. Little wonder some military historians on the committee are hopping. ‘For much of Europe, including Britain in 1918, Germany was a militarist and imperialist regime which had to be defeated and from that point of view, the victory is a serious victory,’ says Brigadier Sir Hew Strachan, Oxford University’s Chichele Professor of War History. If the centenary is simply going to reassert the usual message that it was just a colossal waste of human life, he says, then it would be ‘sterile, a waste of both effort and resources’. Now, every child is taught, rightly, about the carnage on the Western Front. And the passage of time has done nothing to diminish our gratitude and respect for those who died. Indeed, visitor numbers to Great War cemeteries and Remembrance Sunday events are on the increase. … When it comes to the deployment of poison gas, of attacks on civilian shipping, of genocide on disobliging colonies and of general brutish expansionist aggression, it seems that the official line will be: ‘We were all guilty’. Well, at the risk of sounding like Basil Fawlty — or the boy baffled by the Emperor’s new clothes, let me pose a quick thought: who started it? This is not about gloating. It’s not about jingoism. It’s about asking whether this epochal loss of life was completely devoid of cause and purpose. … Everyone is terrified of being called ‘triumphalist’ or, worse still, ‘jingoistic’. … for Heaven’s sake, let us not have a re-run of New Labour’s pathetic 2005 attempts to mark the bicentenary of the Battle of Trafalgar with a ‘blue fleet’ and a ‘red fleet’ — so as to avoid offending the French. The French — who refuse to acknowledge Trafalgar as much of a battle anyway — thought the whole thing hilarious. Moulding the Great War to suit contemporary sympathies is not just a case of historical inaccuracy. It is setting a dangerous precedent. For once you start allowing everyone on all sides to be winners, losers and victims as they see fit, then they will make the most of it. Just look at the way Argentina is rewriting the Falklands saga to suggest that Britain was the imperialist bad guy all along. We might scoff and point to the 1982 invasion of the islands by a fascist junta. But Argentina’s victim narrative is taking root across South America. Who knows? Give it long enough and we may find that we actually lost the Great War after all. Texas Vilified in Le Monde for Being "the State Most Hostile to ObamaCare"
Corine Lesnes travels to Irving to write an article for Le Monde full of spite for Texas, for the Tea Partiers, for Rick Perry, etc, etc, etc. Le Texas est aussi l'Etat le plus hostile à l'Obamacare. Le gouverneur Rick Perry et le Congrès, à majorité républicaine, ont refusé de mettre en place la réforme, et le gouvernement fédéral (comme dans 26 autres Etats) a dû s'en charger. Ancien candidat à l'investiture républicaine pour la présidentielle de 2012, Rick Perry est un défenseur acharné du "modèle texan" ("peu d'impôts, peu de services"). Selon le professeur Calvin Jillson, de l'université Southern Methodist de Dallas, deux statistiques résument son raisonnement : 10 % seulement des "Anglos" sont sans assurance (contre 40 % pour les Noirs et les Latinos), "et les Anglos votent à 70 % républicain". Bref, pour le parti conservateur, l'Obamacare, "c'est une augmentation des coûts sans bénéfices additionnels", dit le professeur. Les républicains ne se contentent pas de boycotter la réforme phare du premier mandat d'Obama. Ils font tout ce qu'ils peuvent pour la "faire dérailler", constate le Texas Tribune. Ted Cruz, la figure de proue du Tea Party, l'a dit : "Si elle arrive au 1er janvier, on ne pourra plus s'en débarrasser." Le sénateur redoute que les Texans prennent tellement goût à leur assurance médicale qu'ils deviennent "accros aux subventions". Susan Norwood, 63 ans, y a déjà pris goût. Esthéticienne, elle paie 350 dollars (257 euros) par mois une assurance qui ne lui rembourse qu'une visite médicale par an et les éventuels accidents ou maladies graves. Grâce à l'Obamacare, elle va économiser 200 dollars par mois. "C'est la grande peur des républicains et c'est notre grand espoir", dit-elle. • My mother had a mild heart attack. Can we see an emergency doctor? 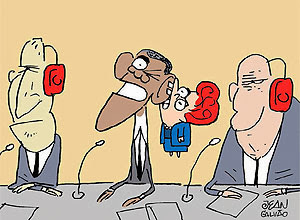 NSA Spying: Who's Listening on This Phone? • But of course I love you mommy! • No, I wasn't talking to you! • I know I told you to "f*ck off"
• No, I'm not telling you again to "f*ck off"! • For Chrissakes! I was talking to the NSA spies! 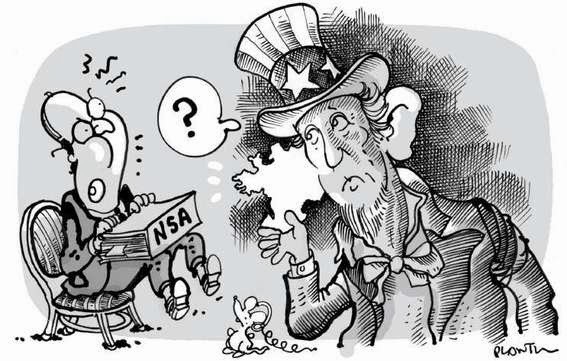 • Mom, was that you who hanged up or was it the NSA guy? writes Nancy Heslin regarding “French signal flexibility on never-on-Sunday rule”. Or maybe the administration could find incentives for foreign businesses to invest in France and create jobs instead of imposing taxes on wealthy earners. The formation of the European Union was supposed to produce a fair marketplace, but the French are choking on their social charges and cannot compete with cut-throat prices offered by Italians or Polish contractors. I would think these fundamental issues need to be revisited before the government tacks on another day to an already grim working week. Otherwise it’s just business as usual. By now, many conservatives have probably experienced the salty language of the Duke with the John Wayne Demolishes Democrats video from a 1975 interview (thanks to Valerie). 3:53: We're being represented by men who are kowtowing to minorities, where they can get votes. And I think it's bad for our country, and I'm sad to see minorities make so much of themselves as "a hyphenated American" — I wish they'd all get to thinking that they are "Americans", as they should; and as they have — luckily — been born here and couldn't be better off in any other place. There shouldn't be so much whining and bellyaching. 4:28: I am saddened by the fact that, although we were a matriarchy, I think we will not be any longer. I think opening doors and tipping your hat to ladies is probably a thing of the past. The forerunners of the women's liberation of today have taken that feeling away from the average American man. 5:05: What about the civil rights?! … I guess that they [blacks] have had a pretty tough break, but not quite as bad as you and your do-gooder friends would have 'em believe. They live as well here as they live in any other country — over that 199 years [of America's history]! True, I think they do have a right to more rights, but it isn't a thing where the rest of the country should feel "terribly guilty" about anything, because they have had a better life here, and their fathers and mothers, than they would have had any place else. And I want to see them have everything! I don't squawk and cry-baby and say "Geez, I had to go without meals when I was 16 and 17 years old, it's a terrible thing!" I don't think that you should look back and whine and belly-ache or try to hold somebody else guilty for everything you did. Obama's Healing Foreign Policy: "The United States has no allies, only targets or vassals"
The Americans must understand that they can not treat us like Iran or Syria! A very strong response is needed, as advocated by the Prime Minister and the Foreign Minister. But the situation is not an easy one, because our reaction can only come within the political and diplomatic realm. Indeed, it can not be legal because in the field of intelligence, the law will always be slower than technology, and international law proves incomplete. However, it is extremely important to remind the United States that we are allies, and that since the birth of their nation. However, we can not behave towards allies as we do towards opponents or enemies. Such a relationship involves trust and reciprocity. The Americans must understand that they can not treat us like Iran or Syria! Ultimately, this new twist reveals that the United States does not have allies, it only has targets or vassals. France is neither one nor the other. We felt that our discussions were on a balanced level, clearly this is not the case. This requires a readjustment and an uncompromising development. That's smart diplomacy fer ya. Il faut une réponse extrêmement ferme, à l'instar de la position défendue par le premier ministre et le ministre des affaires étrangères. Mais la situation n'est pas aisée, car la réaction peut uniquement être diplomatique et politique. En effet, elle ne peut pas être juridique puisque, dans le domaine du renseignement, le droit sera toujours moins rapide que la technique, et le droit international s'avère lacunaire. Cependant, il est très important de rappeler aux Etats-Unis que nous sommes leurs alliés, et ce depuis leur origine. Or, on ne peut pas se comporter envers des alliés comme avec des adversaires, voire des ennemis. Pareille relation implique de la confiance et de la réciprocité. Les Américains doivent comprendre qu'ils ne peuvent pas nous traiter comme l'Iran ou la Syrie ! Au final, cette nouvelle péripétie révèle que les Etats-Unis n'ont pas d'alliés, ils n'ont que des cibles ou des vassaux. La France n'est ni l'un ni l'autre. Nous avions l'impression que nos échanges étaient équilibrés, manifestement ce n'est pas le cas. Il faut donc un réajustement et une mise au point sans concession. The paper laid out how US spies used computer bugs and phone-tapping techniques to monitor French diplomats at the UN and in Washington. German magazine Der Spiegel had previously reported the monitoring of French diplomats, and the Washington Post had revealed the existence of a global cyber-spying programme called Genie. But Le Monde's story gives details of how US agents used the intelligence, apparently gathered from French diplomats under the Genie programme. It quotes a document issued by a directorate of the NSA as stating that the data helped the US sway a Security Council vote on a resolution imposing new sanctions on Iran on 9 June 2010. The US had apparently feared losing the vote, and needed French support. The document quotes America's former UN envoy Susan Rice as saying the NSA's information helped the US "keep one step ahead in the negotiations". 30th Anniversary of the Beirut Bombings: What Really Killed the French Soldiers? Thirty years after an explosion killed 58 French parachutists in their Beirut barracks on October 23, 1983 (little over a minute after a suicide truck rammed the Marines' Lebanese headquarters, killing 241 U.S. Marines), doubts remain on how the attack was carried out, writes Le Monde's Benoît Hopquin. Many witnesses say that despite reports that a truck also rammed the French barracks, none of them saw any vehicles prior to the explosion. It has also been claimed that no remains of a truck were found in the débris of the Drakkar building, leading to the suspicion that the building had been secretly mined all along. Le temps n'a pas non plus levé les doutes sur les causes de l'explosion. La thèse officielle est décrite dans un rapport confidentiel défense. Une camionnette bourrée d'explosifs venait de percuter le siège des marines, près de l'aéroport, tuant 241 soldats américains. "Quelques instants plus tard, malgré les tirs d'une ou plusieurs sentinelles, une autre camionnette se jette contre l'immeuble Drakkar occupé par la compagnie du premier RCP dans Beyrouth-Ouest, à proximité du quartier chiite. La commission d'enquête libanaise conclura à deux attentats exécutés de façon similaire et par ailleurs les enquêtes menées par les autorités françaises aboutissent aux mêmes conclusions." Ce compte rendu lapidaire, le seul qui figure dans les archives officielles de l'armée, est mis en doute par les survivants interrogés par Le Monde. Robert Guillemette, qui était de garde sur le toit du Drakkar, assure n'avoir jamais entendu de tirs. Lucien Jacquart et Dominique Grattepanche non plus. "Je n'ai pas vu de camion", assurent Daniel Tamagni et Eric Mohamed, qui étaient sur le balcon face à l'entrée par où serait arrivé le véhicule piégé. … Le plus étonnant dans l'affaire est que ces témoins directs n'ont jamais été entendus au cours de l'enquête. 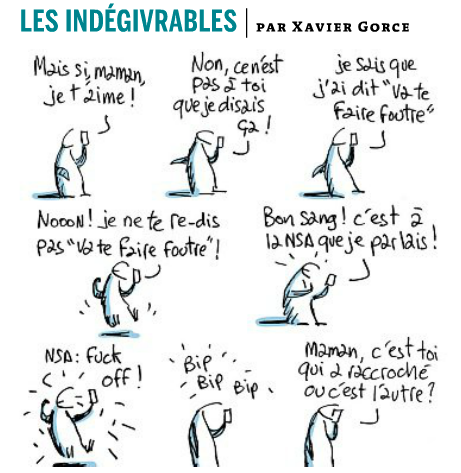 De même, les survivants furent mis à l'isolement par l'armée, avec interdiction de parler à quiconque. Alors, les rescapés avancent une autre hypothèse : l'immeuble aurait été miné. Il était occupé auparavant par les services secrets syriens. Or, à cette époque, l'espionnage français entretient des liens serrés avec son homologue syrien qui joue les intermédiaires avec l'Iran. Aurait-on voulu les exonérer, au nom de la raison d'Etat, comme le suggèrent les victimes ? "Qu'on demande à Rifaat El-Assad . Il vit à Paris. On doit pouvoir lui poser la question", ironise Omer Marie-Magdeleine. Selon le ministère de la défense, la thèse de l'immeuble miné "comporte des apparences de crédibilité mais qu'aucun élément d'enquête n'a étayées". While the White House battles Congress over everything from the budget to ObamaCare, a potentially seismic shake-up is happening in America's relationship with some of its most-longstanding allies. US rift with allies grows as Saudi Arabia, France voice concerns is the title (by Judson Berger) of the top story on Fox News website right now, as France reveals that its embassies were spied upon by the NSA. For weeks now, a damaging trickle of once-secret information about the National Security Agency's spying abroad has outraged U.S. partners. 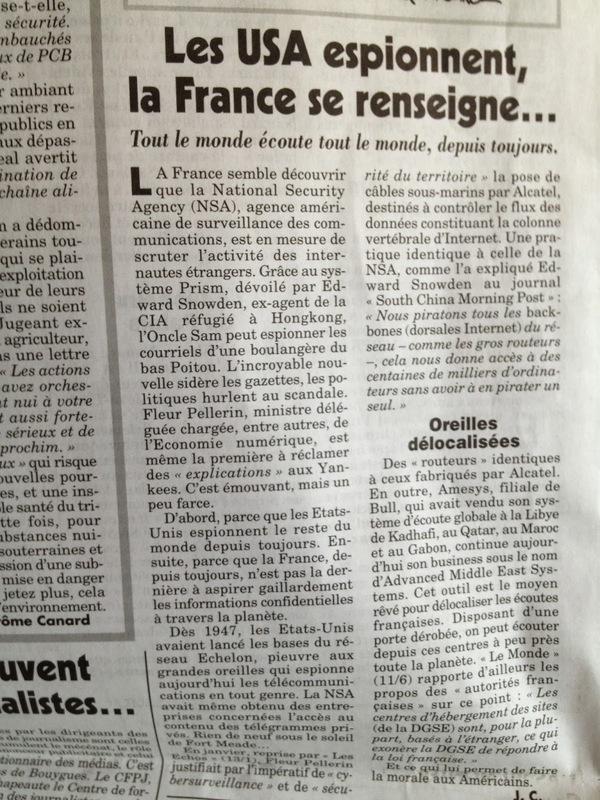 France is the latest to formally protest over its citizens' alleged treatment at the hands of NSA analysts. But new reports are also emerging about a decision by Saudi Arabian officials to distance themselves from Washington. The Wall Street Journal reported overnight that Saudi Arabia's intelligence chief told European diplomats that the country will pull back on its cooperation with the U.S. on arming and training Syrian rebels. … The Saudi pull-back reportedly is tied to disappointment over the U.S. decision not to proceed with a strike on the Assad regime in Syria, as well as a possible softening of the relationship between Washington and Tehran. Fox News Middle East analyst Walid Phares said Tuesday that Saudi Arabia is not alone. "Jordan is in the same view. Kuwait, Bahrain, the U.A.E.," he told Fox News. "What we see forming is a bloc of former Arab allies or of Arab allies who are not very happy." … On the NSA front, State Department spokeswoman Marie Harf noted Monday that the Obama administration is formally reviewing its intelligence-gathering activities, while also reassuring other countries "that we take their concerns seriously." She stressed that the intelligence is collected to protect allies' citizens as well. "People understand the value of intelligence gathering around the world, right? It's where the balance lies between privacy and security, and those are the conversations we're having right now," she said. France is one of America's oldest allies, and U.S. officials are keen to ease the tension over U.S. spying. Flare-ups with other countries have been quick and harsh. Brazilian President Dilma Rousseff nixed a state visit to Washington following reports that the U.S. was tapping into Brazilian communications and networks. Germany and Mexico have also voiced serious concern about U.S. surveillance. A new report in the German magazine Der Spiegel said a division of the NSA once gained access to former Mexican President Felipe Calderon's email account. 1983 and 2013: Eric Mohamed lying among the débris of France's Drakkar barracks in Lebanon's capital (only the parachutist's hand is visible) being comforted by Yves Verdier, and below, trying to cope 30 years later — only once over three decades did the two men meet again. "One wonders what purpose there is in serving one's country" says Eric Mohamed. Thirty years after the October 1983 suicide attacks that killed 241 U.S. Marines and 58 French parachutists in their respective Beirut barracks, Le Monde's Benoît Hopquin visits a number of French survivors for M Le magazine du Monde. In what sounds like the well-publicized trauma accounts for America's Vietnam veterans, Eric Mohamed, Sylvain Fresnay, Farid Guerdad, Daniel Tamagni, Dominique Grattepanche and Lucien Jacquart tell tales of post-traumatic stress and of being forgotten by French society as well as by the army's own hierarchy. Related: 30th Anniversary of the Beirut Bombings — What Really Killed the French Soldiers? While the parachutists were getting up, on Sunday, October 23, around 6:30 am, they heard an explosion near the airport, in the American sector. A mushroom of smoke rose into the sky. The Marines' headquarters had blown up, killing 241. One minute 30 seconds later, the men heard a huge boom below their feet and saw a fireball emerge. They felt lifted into the air and then falling, inexorably, while the walls and ceilings collapsed upon them. Crushed to death by the collapse of the building were 55 parachutists from the 1st Régiment de Chasseurs Parachutistes and three from the 9th RCP, along with — we often tend to cruelly forget them in the balance sheet — the wife of the Lebanese caretaker and her four children. Daniel Tamagni: "On September 11 , Lebanon's wounds woke up in my head"
"Le 11-Septembre, les blessures du Liban se sont réveillées dans ma tête"
Régulièrement, d'anciennes douleurs se réveillent. La première fois, c'était en septembre 2001, quand les tours de New York se sont effondrées. Daniel Tamagni souffrait le martyr mais les examens ne montraient rien. 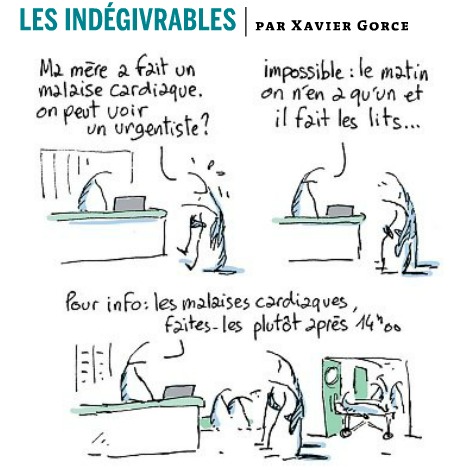 Les médecins ont fini par comprendre. "Les blessures que j'avais eues au Liban se réveillaient dans ma tête." Daniel Tamagni sait à quoi peut ressembler la mort. Quand il était bloqué sous les décombres, le bras perforé par un bloc de béton, la poitrine comprimée par les sacs de sable, il l'a vue approcher. "On ne crie plus, on ne souffre plus, on a une bouffée de chaleur, on voit une lumière au bout d'un tunnel. On s'endort avec le sourire." Après cinq heures de combat, les sauveteurs l'ont arraché aux décombres. "C'est comme si on me sortait du tombeau. Le corps est là mais l'âme s'en est allée." Farid Guerdad: "In my nightmares, I am walking on the heads of my mates"
" Dans mes cauchemars, je marche sur la tête de mes camarades "
Farid Guerdad … peut raconter ses nuits d'insomnie, le sommeil haché, peuplé toujours du même cauchemar : "Je suis dans le bâtiment et je marche sur la tête de mes camarades." Il ouvre le dossier rouge, aujourd'hui délavé, sort une photo prise sur la barge de débarquement, à Beyrouth. "Sur quatorze, nous ne sommes que quatre survivants." L'émotion le submerge. Sylvain Fresnay: "The only indemnity I received was 500 Francs and a sweater"
"Pour tout dédommagement, j'ai reçu 500 francs et un survêtement"
Comme il n'a pas été blessé dans les décombres, Sylvain Fresnay n'a droit à aucune pension, à aucune médaille. … Il a perdu tous ses papiers, tous ses souvenirs. Il regrette surtout le pull que lui avait offert sa fiancée, Patricia. "Pour tout dédommagement, j'ai reçu 500 francs et un survêtement." On lui rendra plus tard quelques photos dans une enveloppe kraft. "Pas toutes. On les a triées." Sylvain Fresnay achève son service militaire dans les brumes de l'alcool. "Ma solde y passait." Avec d'autres rescapés, il casse deux fois de suite un bar où on s'était moqué des gars du Drakkar. Il refuse le galon de sergent qu'on lui propose. "Prends-le pour les copains", lui disent des sous-officiers qui étaient avec lui dans l'immeuble. Il accepte mais, en signe de protestation, il se présente à la remise avec le survêtement que lui a concédé l'armée. Dominique Grattepanche and Lucien Jacquart: "People are already starting to forget the dead in Afghanistan. So, our chums in the Drakkar building, whaddya think…"
"On oublie déjà les morts d'Afghanistan Alors les copains de Drakkar"
Les deux hommes participent à toutes les cérémonies officielles. Lucien Jacquart enfile son uniforme et porte le drapeau. "On oublie déjà les morts d'Afghanistan. Alors, les copains de Drakkar, vous pensez... Si nous ne sommes pas là pour honorer leur mémoire, qui le fera ?" Eric Mohamed: "One wonders what purpose there is in serving one's country"
"On se demande à quoi ça sert de rendre service à son pays"
Quand il était sous les décombres, une jambe écrasée sous un bloc de béton, le filet de lumière qui filtrait a été son seul lien à la vie. Grattant les gravats avec sa baïonnette, il est parvenu à glisser son bras par l'ouverture. Il a senti une main tendue à sa rencontre. Il l'a happée et ne l'a plus lâchée. C'était la solide pogne d'un autre para, Yves Verdier, son sauveteur. Des photographes ont saisi cet instant. Le cliché est devenu le symbole de cette journée tragique, par antiphrase, en ce qu'il recelait d'humanité. … on l'a bien laissé tomber, le vieux para. Récemment, il a vu un reportage à la télévision sur des jeunes qui entraient dans son régiment, le 1er RCP. "L'officier disait : "Souvenez-vous de vos anciens qui en ont bavé." ça m'a fait marrer. Moi, ils m'ont bien oublié, va. On se demande si ça sert à quelque chose de rendre service à son pays." … Eric Mohamed a été retiré de l'immeuble avec une double fracture tibia-péroné, un traumatisme crânien et "une tête de bouledogue". En juin 1984, il a résilié son contrat militaire. "Quand je suis allé rechercher mon paquetage à Pau, ce n'était pas loin de "Casse-toi". J'étais considéré comme un lâcheur." Il est retourné chez lui, à Saint-Alban-de-Roche. "ASSIS LE CUL SUR UNE BOMBE"
On les a installés dans un des quelque trente casernements qu'occupait le contingent français de la force multinationale à Beyrouth. Ils portaient tous des noms de bateau. Eux, ce fut Drakkar. Ils ne sortaient que pour les patrouilles, dans le secteur qui leur avait été attribué. Ils n'ont pas tardé à comprendre qu'on les avait "mis au milieu d'un merdier", "assis le cul sur une bombe". D'une rue à l'autre, ils percevaient de la sympathie ou de l'hostilité. Dans les quartiers chiites où trônaient les portraits de Khomeiny flanqués de drapeaux noirs, ils ressentaient la haine. Le dimanche 23 octobre, vers 6 h 30, alors qu'ils se préparaient, ils ont entendu une explosion du côté de l'aéroport, dans le secteur américain. Un champignon de fumée s'est élevé dans le ciel. Le siège des marines venait de sauter, faisant 241 morts. Une minute trente plus tard, les hommes ont entendu un énorme boum sous leurs pieds et vu sortir une boule de feu. Ils se sont sentis soulevés puis inexorablement tomber, tandis que les murs et les plafonds s'écroulaient sur eux. Cinquante-cinq paras du 1er RCP, trois du 9e RCP et, on les oublie souvent cruellement dans le bilan, la femme du gardien libanais et ses quatre enfants sont morts écrasés par l'effondrement de l'immeuble. Pendant un mois, l'opinion publique s'est émue du drame. Les chambres des quinze blessés, à l'hôpital du Val-de-Grâce, étaient gardées par des gendarmes pour empêcher les journalistes et les groupies d'entrer. Les morts ont été enterrés dignement, avec une belle cérémonie dans la cour des Invalides. Et puis on a oublié. Pour la quarantaine de survivants de la 3e compagnie, trente ans n'ont rien effacé, bien au contraire. Tous gardent des séquelles psychologiques graves. L'un, qui a passé quarante-huit heures dans les décombres, est devenu amnésique. Un autre s'est détruit les neurones par l'alcool et la drogue. Un autre est interné en psychiatrie. Un autre est mort dans un accident de voiture inexpliqué. Le 7 mars dernier, Christian Roulette, qui n'avait plus jamais donné de nouvelles, a été recontacté par un ancien copain. Ils sont restés quarante-huit minutes au téléphone. Deux jours après, Roulette avait disparu. La gendarmerie le recherche toujours. Les survivants n'ont jamais eu le moindre suivi psychologique. Leur douleur et leur colère sont toujours là, prêtes à sortir en éruption. Aujourd'hui, ils pestent contre ceux qui lésinent sur des pensions d'invalidité de 100 ou 200 euros, comme une dernière forme de mépris. Ils se sentent abandonnés. 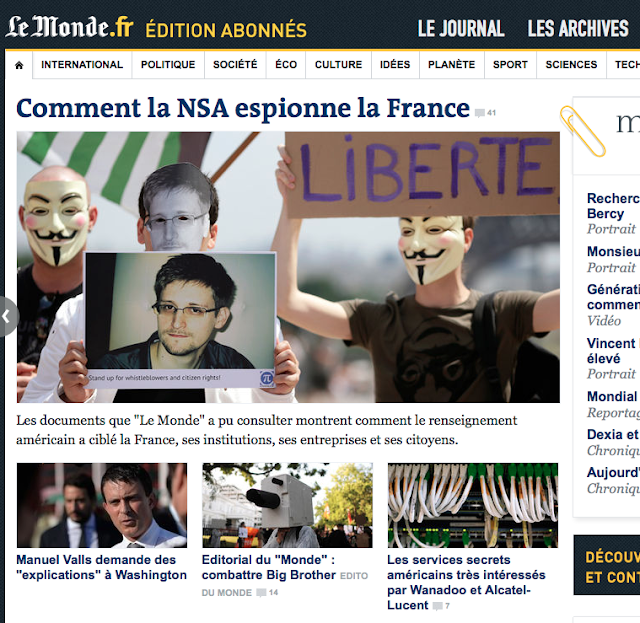 Figuring prominently on Le Monde's website, French outrage is back over America's secret services and how the NSA is spying on France, spurring a Le Monde editorial and protests from the French government. The only problem with that, of course, is that Le Monde itself already revealed two months ago — as did Le Canard Enchaîné — that France is as deeply engaged in the spying business as much as anyone. Thus wrote Stever Erlanger already back in July. Le Monde reported that the General Directorate for External Security does the same kind of data collection as the American National Security Agency and the British GCHQ, but does so without clear legal authority. 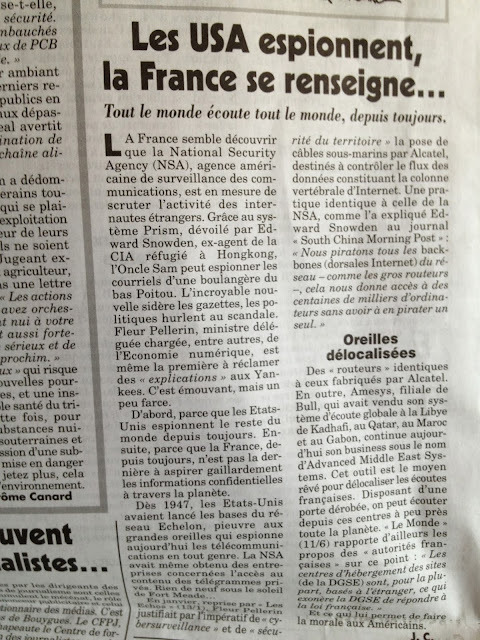 … Le Monde’s report, which French officials would not comment on publicly, appeared to make some of the French outrage about the revelations of Edward J. Snowden, a former N.S.A. contractor, about the American data-collection program appear somewhat hollow. But French officials did say privately on Thursday that there was a difference between data collection in the name of security and spying on allied nations and the European Union. While French officials have said that they do not spy on the American Embassy in France, American officials are skeptical of those reassurances, and have pointed out that France has an aggressive and amply financed espionage system of its own. … American officials had privately warned French officials to be careful about speaking with too much outrage about American espionage given that major European countries like France spy, too, and not just on their enemies.